Celebrate Twice this New Year's Eve in Mexico Beach, FL! Count Down to 2018 Twice in One Night! LOVE Celebrating? What’s better than ringing in the new year on the beach—twice!—with Mexico Beach, Florida? The Celebrate Twice event is back this year for another fun evening of fireworks, food, music, and memories on the Unforgettable Coast! 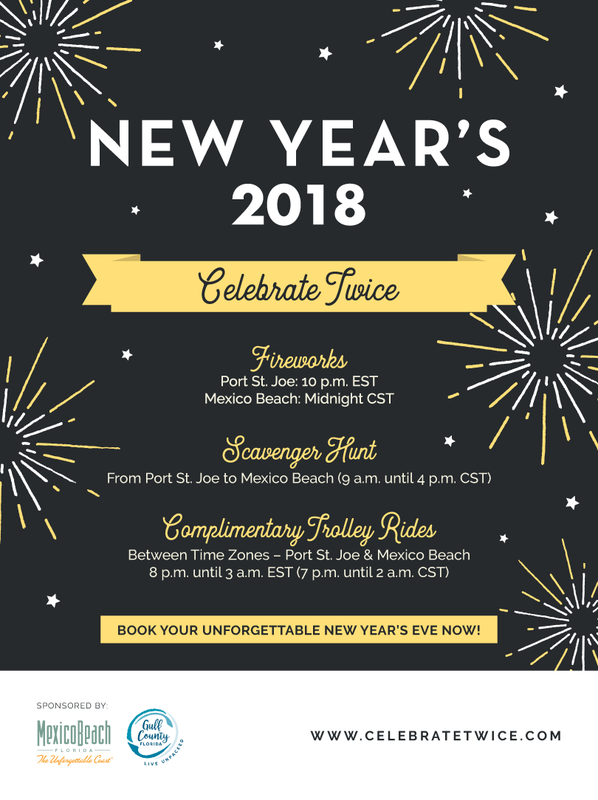 After you say “Happy New Year” in our neighboring town, Port St. Joe, which sits on the edge of the Eastern Time Zone, take a free trolley just 20 minutes back to the Central Time Zone and do it all over again in Mexico Beach! The party begins December 31 with a family-friendly Scavenger Hunt across Mexico Beach and Port St. Joe. To join the fun, be sure to print out your free Scavenger Hunt card at CelebrateTwice.com and visit the four businesses listed to pick up some New Year’s Eve party favors and get your card stamped. Once you complete your card, turn it in at the Mexico Beach Welcome Center or Gulf County Welcome Center by 2:00 p.m. CST on January 1 to enter for a chance to win a Mexico Beach and Port St. Joe Gift Bag! A New Year’s Eve celebration is not complete without fireworks! Luckily, there will be two chances to catch the magic of fireworks as we count down to 2018. The first show starts at 10:00 p.m. EST over the Port St. Joe beaches, and the second showers Mexico Beach at midnight CST. Say goodbye to 2017 and hello 2018 as these spectacular displays light up the sand of the beautiful Gulf Coast. The one-of-a-kind celebration is sponsored by the Mexico Beach Community Development Council and Visit Gulf County. Visit our Places to Stay page for great deals on condos, houses, motels and even campgrounds. It’s not too late to book your New Year’s getaway! Share your New Year’s Even photos with us on social media! 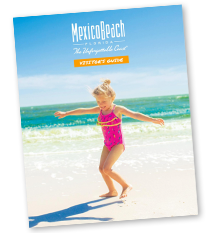 Follow our accounts at @mexicobeachfla on Instagram and Twitter, and tag your vacation photos with our hashtags for your chance to be featured.